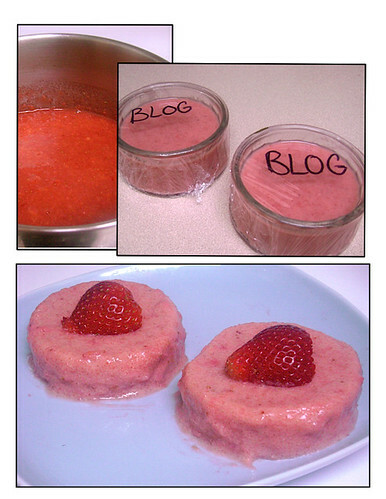 Way back – well, last month, when I was going to make my brother’s birthday cake but didn’t end up doing so (we had strawberries and custard instead), I was still determined to make the make the mousse with the strawberries that we’d got for the cake. It was a two-pound container and I think one pound had already been eaten with the custard, so I used the rest to make the mousse. Filming how to make the mousse (click here to watch the video or watch below, following the recipe) was both trying and amusing. My sister wrote about it on her blog, and I’ll be posting my side of the story (sort of) here in a few weeks to come. I made a comic strip about it. I was very excited to see that Mrs. Ed of Mrs. Ed’s Research and Recipes is hosting this month’s theme of Go Ahead Honey, It’s Gluten Free. This strawberry mousse is my submission for this month’s theme, gelatin. If you’re interested in participating, visit her blog for this month’s theme’s details. The deadline is May 27th, 2010. The mousse is very easy and quick to prepare. The longest you have to wait is while it’s setting. It’s dairy-free and doesn’t use raw egg – the only egg ingredient is the yolks used to make the custard, which works as a substitute for yogurt. The custard is the same that I used with the strawberries; I promise that the recipe for the custard is linked correctly this time! (I’m still in the process of updating my interlinks.) If fresh strawberries aren’t available, I’ve also used frozen and they work just as well. Puree the sliced strawberries. Pour the cold water in a small pot and sprinkle the gelatin over water, softening it. Mix in the citrus (orange and lemon) juices, before adding the strawberry puree and honey. Cook over low heat until honey is dissolved. Transfer into a bowl in an ice bath or use an ice pack. (Make sure the water does not flow into the bowl if using ice bath.) Stir for 10 to 20 minutes, or until it’s the consistency of raw egg whites. Mix in the custard and vanilla. Pour into molds (if you have ring molds, you may use those) and cover, chilling in the fridge until set, about 8 hours or overnight. The mousse can be eaten right out of the mold or removed by briefly placing the mousses in a lukewarm water bath (make sure the water does not flow over into the mousse) and running a knife along the edges to loosen. Quickly turn the mousse upside down on a plate. 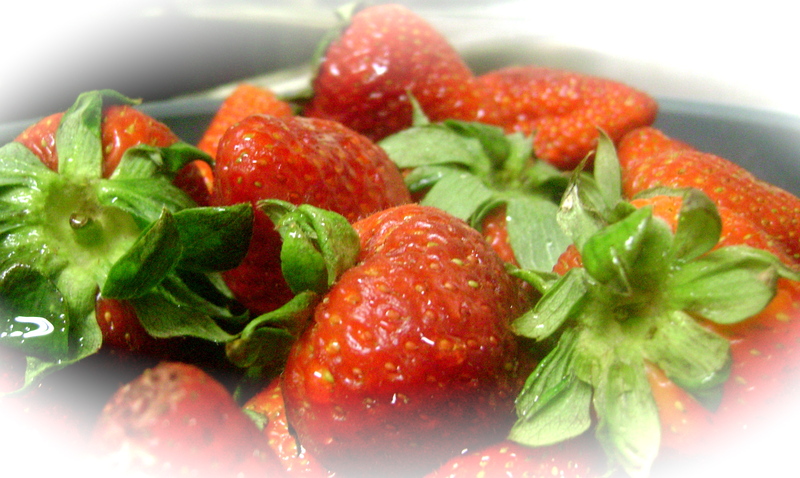 Garnish with extra strawberries or other fruit, if desired. Serve and enjoy! What a lovely summer treat! I think these would be a nice and light after dinner treat to beat the heat or just because anything with strawberries is sensational! 😀 Looking forward to your guest blogging on the other site and can’t wait to see what you come up with. The strawberry Mousse looks delishhh and I really like your video posts. Great idea. Thank you, Gitte! 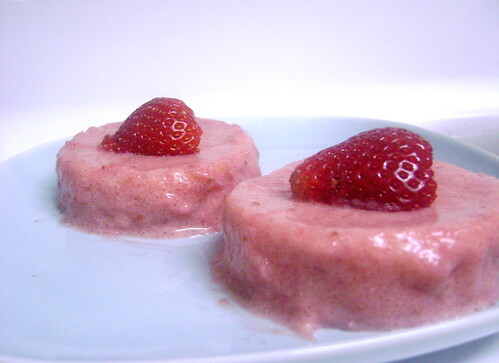 If you try making the strawberry mousse, let me know how it goes. Yum. What a fantastic way to use strawberries. I will definitely have to make this one! Hi Sara, it’s really good! It would also probably work well with other fruit, too. This looks so good! This is actually the recipe that drew me to your blog! I love that your recipes are GF, CF, and refined sugar-free! That is how I lived for a very long time. I’m now in the process of an elimination diet to see what for sure are allergens for me, so I don’t know if I will be GF and CF again or not…but probably definitely refined sugar-free! I can’t wait to try this recipe when I get to that point on the elimination diet….unfortunately I am along ways from being there yet! I think I may be adding in things too fast….but anyways, thanks for the recipe and the great blog! Feel free to drop by TheFrugallyRichLife (www.thefrugallyrichlife.wordpress.com) for my GF, DF, refined sugar-free recipes and frugal tips etc, anytime! I’d love to have ya! 🙂 I’m also on facebook (Ariana Anderson) and twitter (FrugallyRich). These look so fancy! Thank you for submitting them. They look so great and nice. I really hope that mine turn out as good as yours. great recipe! !